This 3 Video set has been produced by top professional academy coaches from AFC Fiorentina and the successful Empoli FC. They have shared their knowledge with you to include 292 exercises used to coach players to elite 'Technical Excellence' standards. The Soccer Italian Style ('SIS') teaching methods are used in the professional academy technical and tactical training programs of the Italian Serie 'A' developed by Mirko Mazzantini "ACF Fiorentina" and Simone Bombardieri "Empoli FC". 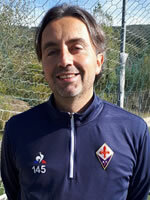 ACF Fiorentina Academy Coach U14/16 since 2010. ACF Fiorentina Academy Coach since 2012. Develop your Players to reach Elite 'Technical Excellence', with the same training program used in top Professional Academies like AFC Fiorentina and the successful Empoli FC. This teaching method has been developed in the youth and academy technical skills training programs of the Italian Serie 'A'. It has been very successful in team development coaching programs that have produced players with exceptional technical skills. The simplicity of this program is a major reason for its success. These 60 exercises aim to develop, improve and maintain individual technical skills regarding ball control. Suitable for players of all ages and abilities , these exercises can be carried out in groups, pairs or alone - all you need is a ball..
All of these exercises have a play for fun aspect that stimulates the will and motivation of the players during the workouts. 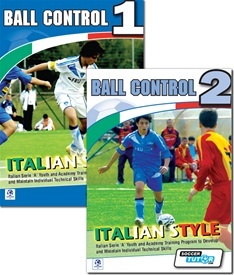 Improve your ball control Italian Style! 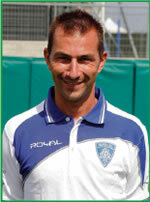 Mirko Mazzantini coached at Empoli FC for 10 years, working with all the main age groups at academy level. In 2010 he was recruited by AFC Fiorentina to work with the U14/U15 Academy teams. During the 2010/11 season Mirko won the U15 Italian Academy Serie ‘A’ championship. In 2011/12 Mirko was the Assistant of the Fiorentina Reserve team during pre-season and he was the coach of the ACF Fiorentina U14 team who won the Academy Serie ‘A’ championship and some international tournaments. 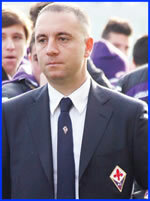 Mirko is currently the ACF Fiorentina U15 coach for the 2013/14 season. He is a qualified football coach through the “Young Players Coach” program and a UEFA ‘B’ Licenced Coach, as well as an author of many coaching publications, articles, books and DVDs. 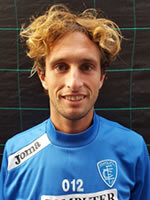 Simone Bombardieri played for Empoli FC for 5 years. He then started his career as a coach for the club 15 years ago at the age of 22, where he has been coaching various academy age groups from U9-U14. In the 2011/12 season, Simone was the coach of the Empoli FC U14 team who reached the final of the Nick Cup International Tournament, where they lost in extra time against Inter Milan. They also finished eighth in the Academy Serie ‘A’ championship. 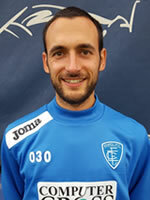 Simone is currently the Empoli FC U15 coach for the 2013/14 season. He is also a qualified football coach through the “Young Players Coach” program and a UEFA ‘B’ Licenced Coach, as well as an author of many coaching publications, articles, books and DVDs. This is a fantastic opportunity for you to learn from the coaches at Top Professional Academies like AFC Fiorentina and the successful Empoli FC. It has been very successful in team development coaching programs that have produced players with exceptional technical skills. These simple exercises for ball control develop the technique of feinting, dribbling and change of direction are a progression ( from Ball Control 1) starting from skill based exercises to game situations with the final objective to shoot on goal. In modern soccer one of the most effective key to “unhinge” the opposing defensive lines that are organised tactically is to win the 1vs1 duels. For this purpose we are presenting more than 40 exercises to improve ball control and to stimulate their imagination and creativity at the same time. The technique of feint and dribbling is one of the fundamental techniques for player development and it appears to be an additional tool for all youth coaches who love working on technical skills. It has been very successful in team development coaching programs that have produced players with exceptional technical skills. 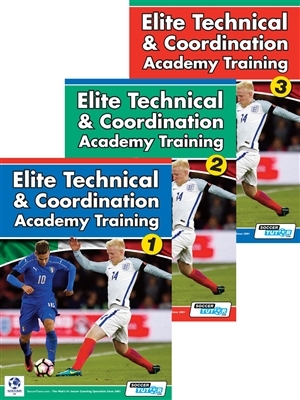 This 2-Digital Video Set includes over 100 progressive technical skills and excercises that will help you develop your players technique of feinting, dribbling and change of direction starting from skill based exercises to game situations with the final objective to shoot on goal. Age Group suitable for: from age 6 - 12+. Marking, tackling, intercepting/anticipating, positioning and defending the goal are fundamental elements in the modern game of football. 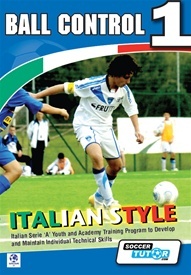 The Italian Style coaches present more than 40 technical exercises and game situations for the physical and mental development of young soccer players. 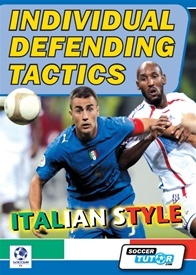 The exercises focus on the defensive phase, with the primary objective to develop the tactical awareness and abilities of the defenders, who are more and more scarce in the modern game of soccer. 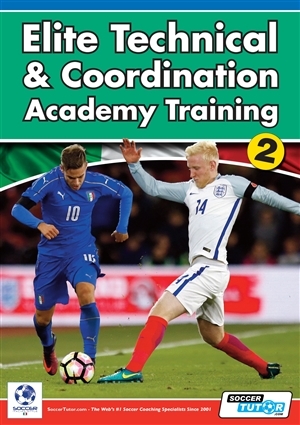 These exercises are based on the training methodology used at Italian Serie ‘A’ professional clubs to develop their academy players to highly skilled and tactical astute level. 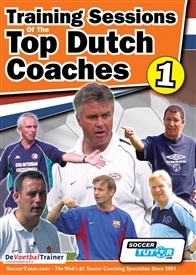 On Volume1 of this DVD series Guus Hiddink, Ronald Koeman, Henk ten Cate, Bert van Marwijk, Rene Meulensteen and Frans Hoek will show you how to train players of all levels. This is a completely unique opportunity for you to learn from these top professional Dutch coaches! 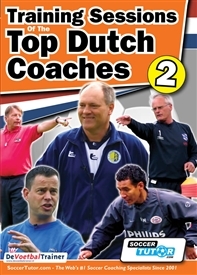 On volume 2 of this Video series there is over an hour of training sessions with Martin Jol, Co Adriaanse, Foppe de Haan, Ricardo Moniz and Raymond Verheijen who will show you how to coach players of all levels. Now you can use the same practices for your own sessions from the same Top Dutch Coaches that coached at; Ajax, Spurs, Fulham, Porto, Dutch National Teams, Feyenoord, PSV, FC Barcelona, Chelsea, Manchester City and many more.. 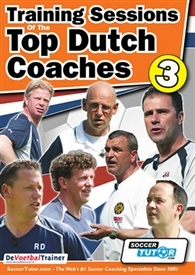 This gives you a completely unique opportunity to learn from these top professional Dutch coaches! Age Group suitable for: from age 8+. Roda JC, RKC Waalwijk, Tottenham Hotspur, Hamburger SV, Ajax and currently at Fulham FC. FC Zwolle, ADO Den Haag, Willen II, Ajax, AZ, Porto, Metalurh Donetsk, Al-Sadd, Red Bull Salzburg, Olympic Qatar and now FC Twente. Head of Youth Development for five seasons at Ajax. Analytical importance of "Coerver Coaching Method"
KNVB - tutor for the subject of football endurance training. Achieved success as exercise psychologist/football endurance coach by coming third at World Cup 2002 with South Korea working with Head Coach Guus Hiddink. As well as viewing these sessions you can listen and view all the coaching points translated into English. This exclusive look at professional coaches at work will help you coach of any level to improve your players and teams abilities, you'll also learn new ideas. To help you there are very clear and detailed animations which accompany each video session. This DVD combines the talents of some of the best coaches in the world to provide a huge resource and a very high level of content which is extremely rare.